Plastic mandala stencil is a tool for making your own beautiful mandalas template. You will receive a sketchbook and photo instructions also. Traumatic events, by definition, overwhelm our ability to cope. When the mind becomes flooded with emotion, a circuit breaker is thrown that allows us to survive the experience fairly intact, that is, without becoming psychotic or frying out one of the brain centres. The cost of this blown circuit is emotion frozen within the body. 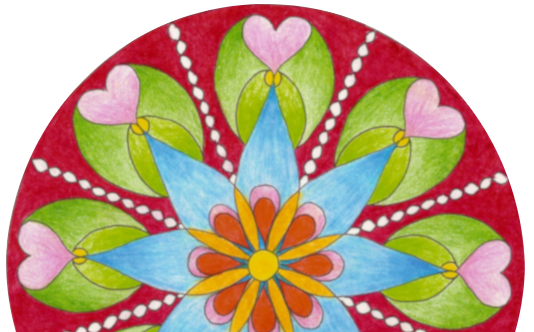 Today mandalas are used not only in psychotherapy, but also as „coloring books” for adults or as a tool for relaxation and spiritual cleansing. They are also increasingly used by children. It is surprising how even all the hyperactive children can enjoy the calm creation, how the generally apathetic children become alive and how kids with various disabilities get involved in drawing as well. Relaxation is an essential part of "psycho-hygiene". It helps us to recollect strength, to recover and it allows us to see situations from distance. These are the reasons it should become an everyday part of our lives. Teach your children how colors are created and what they can capture! Let's play and explore the world. Drawing, as well as writing, can work as a form of therapy (art therapy). Everybody can draw and everybody draws in their own specific way. Rule number one is: “Don’t compare yourself with anybody”. Every person has different dispositions especially, in the spiritual sense of the word. and never miss our news!